Hello! It’s Kelsi Singer again from the New Horizons science team to talk about one of my favorite planetary geologic features –impact craters. They may just look like holes in the ground, but amazingly, craters can give us all sorts of useful clues to a planet’s history. There are many ways scientists investigate a planet they’re seeing for the first time, and this is one example. With a flyby mission you can’t probe the ice on the surface or analyze samples, so you have other methods to determine a planet’s makeup and age – and gain insight into how it evolved into the world it is today. Analyzing craters can help us understand the age of a planet’s surface. A surface with more craters indicates that it’s older, geologically, than a less-cratered surface. Pluto displays many good examples of this concept. 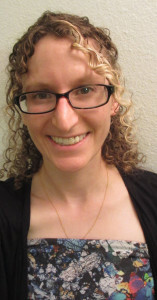 Any guesses as to which parts of Pluto mission scientists think are younger? 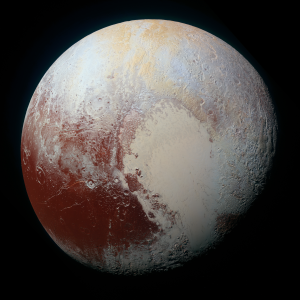 If you went with the informally named Sputnik Planum – the left half of Pluto’s “heart” feature – as a young geologic unit, then you are on the right track. So far we have not identified any obvious craters on Sputnik Planum. We can also try to put an actual date on a surface (e.g., that a given surface is 1 billion years old), but this is more difficult because it requires some knowledge of how often impactors (chunks of space debris) of a certain size hit the surface to make craters. 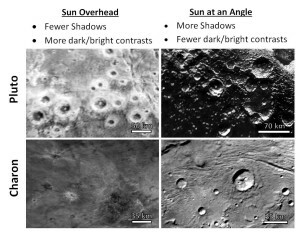 These close-up images of Pluto and Charon illustrate the effect of lighting geometry on the appearance of craters. Age-dating based on craters is complicated by a number of other factors as well. I will highlight one big issue here: How one “sees” craters is affected by lighting over the planet’s surface. Just like on Earth, the lighting on Pluto and Charon changes both with latitude and over the course of the day. When the sun is directly overhead, there are very few shadows cast and it is hard to see topography, but that overhead lighting makes it much easier to see dark or bright markings. The opposite is true when the sun hits the surface at a shallow angle near sunrise or sunset: topography is easy to see, but bright and dark colorations are often washed out. Because New Horizons flew by Pluto so quickly (in just a few hours out of Pluto’s day, which is 6.4 Earth days), our highest-resolution pictures were all taken under the same lighting conditions. The northern latitudes of Pluto and Charon have the sun mostly overhead, while near the equator the sun hits the surface at an angle. This gives the effect that craters in the north look flatter and have stronger dark/bright contrasts, while craters near the equator look more 3-D. There are many other complicating factors, such as variable image resolutions and variable surface erosion or degradation. Even fragments of surface material ejected while creating a “primary” crater can pose a problem because they may litter the surface and make smaller, so-called “secondary craters” that influence crater statistics. We are taking all of these factors into account as we map Pluto and Charon’s craters and mine this data to learn more about the history and evolution of these amazing, mysterious worlds.